Last week I created a fall centerpiece for my museum group's annual tea. After seeing so much inspiration on Pinterest using pumpkins for floral containers, I just had to try it. I started with a huge heirloom pumpkin from the grocery store, scoring the top to accommodate the plastic container that would sit inside to hold water. 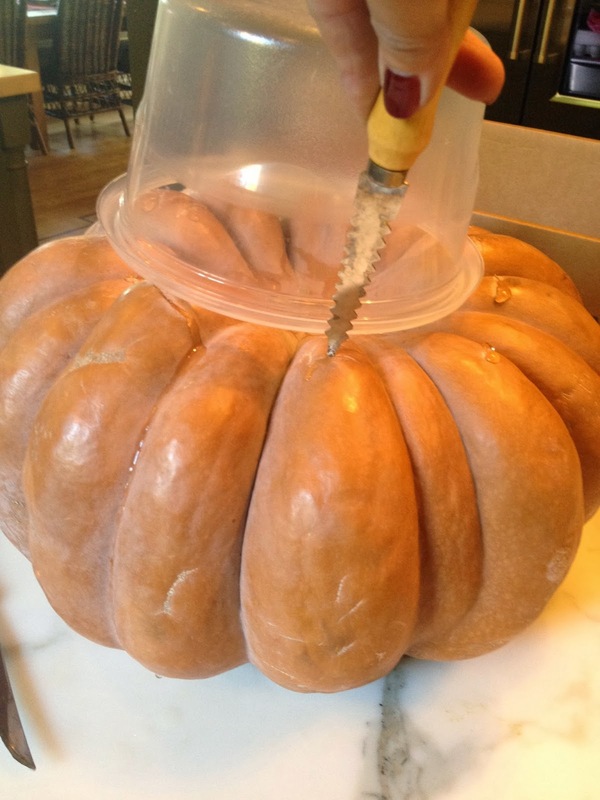 I thought this would be hard, but cutting through the pumpkin was like slicing butter! The plastic dish fit right inside, ready for the flowers. I used two fall bouquets from the grocery store and filled in with blue hydrangeas from my garden. Before I knew it, I was creating a tablescape! The centerpiece was my muse, and I had just the dishes to go with it. I couldn't pass up these transferware dinner plates from Homegoods recently, priced at $4.99 each. 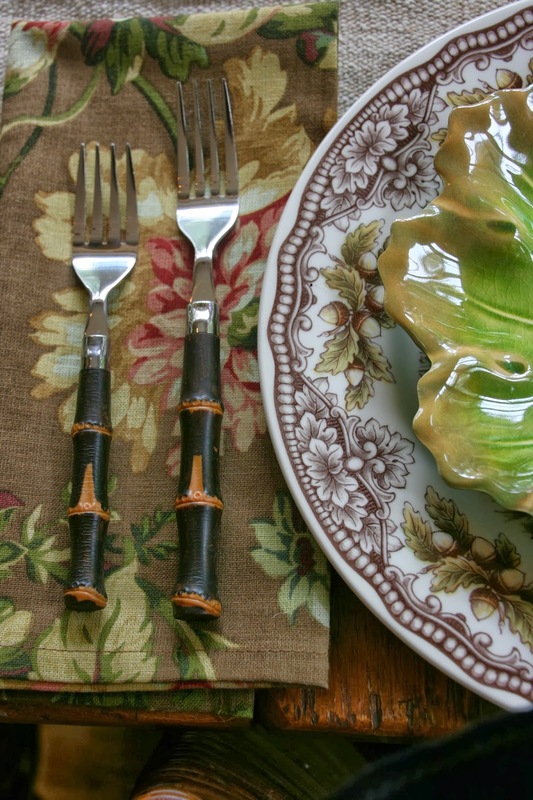 They would be perfect for Thanksgiving, but for now, they are perfect for a fall tablescape. I layered these faux majolica salad plates from Pottery Barn over them for interest and texture. I say faux because they are actually melamine. You seriously cannot tell they are plastic until you pick them up! Bamboo silverware picks up the browns from the transferware plate. The brown floral napkins are Ralph Lauren. The purple goblets are from Goodwill and the try-color goblets are from TJMaxx. 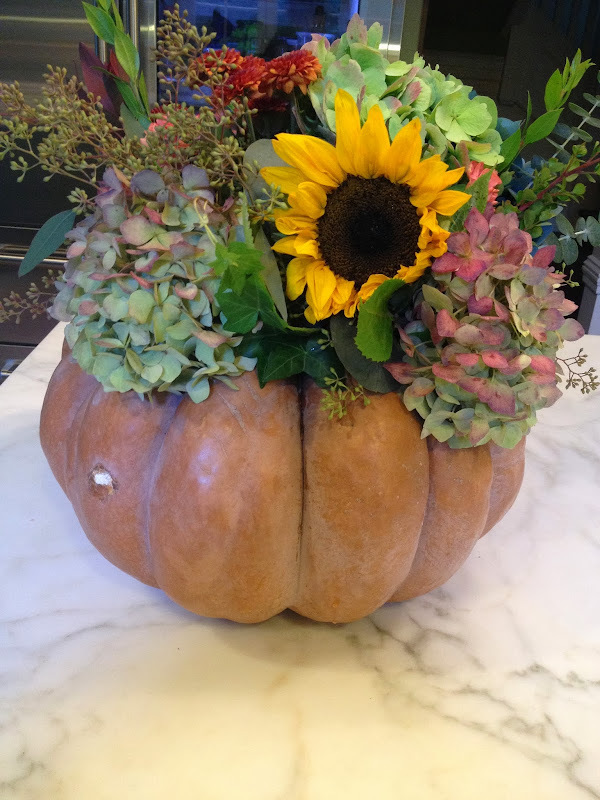 It's been so long since I created a tablescape, but my pumpkin centerpiece got my creative juices going again! It was so easy to do, that I think it will be my go-to centerpiece for Thanksgiving this year. Just as I was lighting the candles, Mr. A came home and asked what's for dinner? The next day, after I delivered the centerpiece, I ended up creating yet another centerpiece with the three tiered stand and lots of mini pumpkins, gourds and pods. It's beginning to look a lot like fall around here! Beautiful! You are the queen of tablescapes! simply gorgeous! 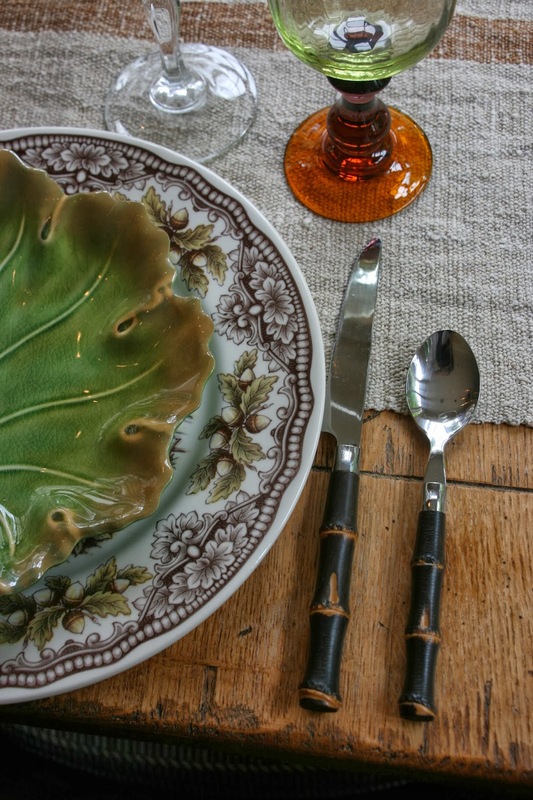 those leaf plates are wonderful, who would know they're not the real deal! You created a wonderful centerpiece and table! Beautiful and festive, and loved the candles too! Truly beautiful!! Love all that you do! Delores that pumpkin centerpiece turned out BEAUTIFUL! Love the three tiered display too! so typical of men to want to eat when they see a pretty table! In my opinion, your centerpiece turned out better than all of the samples you posted previously! I love that you chose the (Fairytale) pumpkin and of course how can you go wrong with hydrangea and sunflowers? Gorgeous!!! Beautiful!!! Your pumpkin turned out great! Love it all Delores! 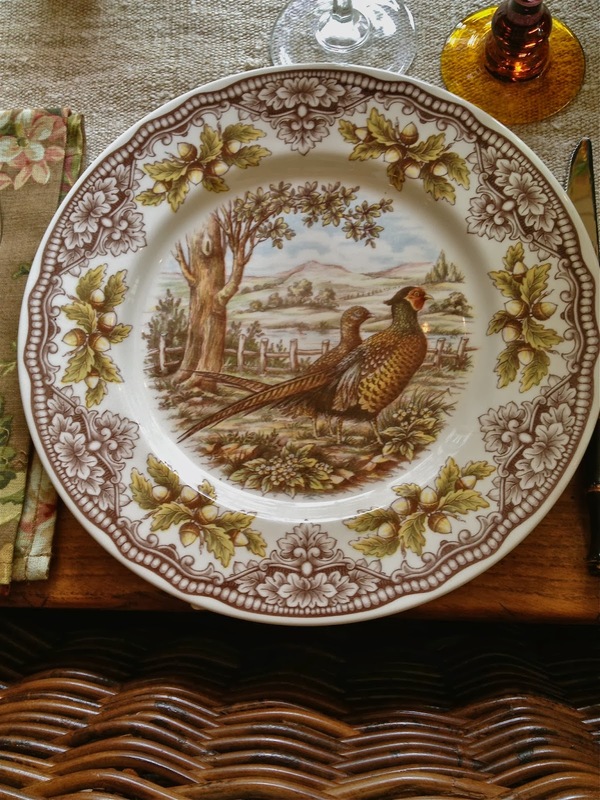 When I first discovered your blog I was blown away by your table scapes and was first inspired to do some of my own, something I hadn't done much of. Then you stopped! I remember thinking that just when I got going you were not doing it much anymore! I am glad you are "re-inspired"! Your tables and all your table ware are so beautiful that they really inspire me! Love this tablescape and the centerpiece is beautiful. it would be hard to chose my favorite...they are both gorgeous! Beautiful centerpiece Delores! Love the beeswax candles (aren't they the best?). I LOVE the centerpiece. I'll have to give this a try. The tablescape is beautiful as well and perfect for the season. You are so talented. Can I get a little of that??? I am decorating challenged. Kind of Bohemian. Of course, I live in a 150 year old house and I am surrounded by other BoHo's in my community. My sister comes to visit and giggles as she says, "It looks like a professor lives here"...whatever that means. Anyway--I love the pumpkin centerpiece. Sooooo pretty. My daughter also found some purple goblets like yours at Goodwill. They are so pretty. She loves them. Your tablescape was very pretty too. Gorgeous! I am going to use my three tiered stand in just that same fashion for a home tour...so glad to see it already done!!! What a perfect fall tablescape! I love the bamboo silverware. 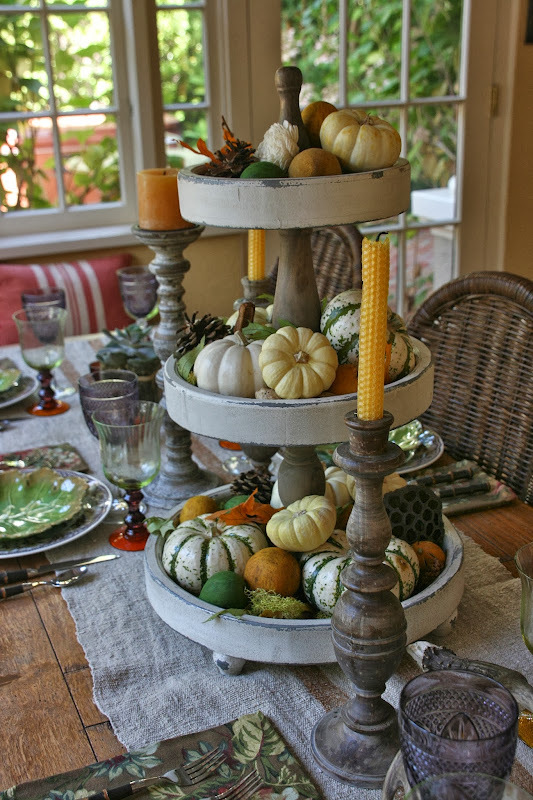 love everything and the three tiered stand with mini pumpkins is so cute! Beautiful! What a pretty centerpiece and so easy too! A perfect fall tablescape. I know the ladies must have really loved the centerpiece you created! Recently I put succulents into a real pumpkin using a plastic cup as a temporary "pot" for them. But I also love your tiered stand as a centerpiece as well! Absolutely gorgeous, Dolores! I love the centerpiece and STILL can't believe those plates are melamine!!! I am RUNNING to PB!!!! Fabulous table as always!! I left my local fruit & veg guy shaking his head as I proudly carried my pumpkin thru the cash out lane. 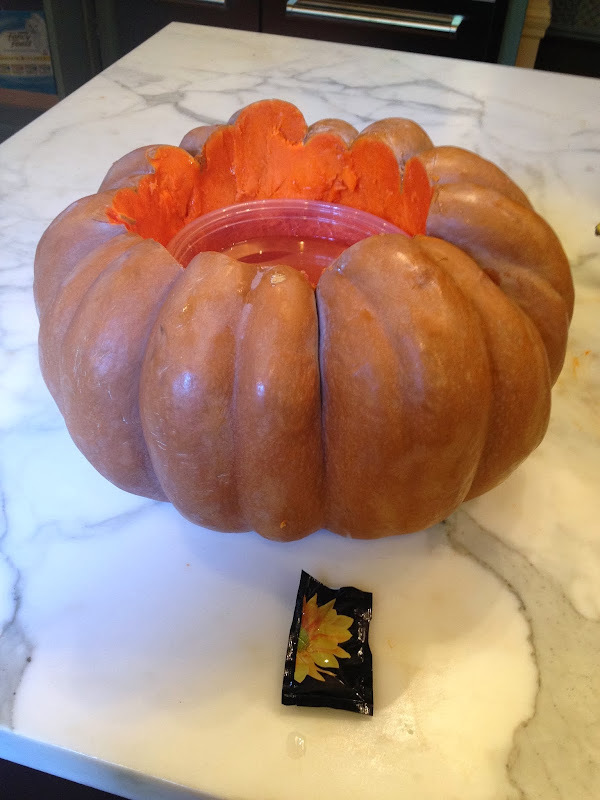 He asked what (food) I would be making with this gorgeous pumpkin. His jaw dropped when I said "oh, no, it's for a flower arrangement". You could just read his mind, " crazy American woman"! Oh Delores - these look just perfect. I love the plates & would never have guessed the leaf ones were melamine. Keep Calm And Get A Flu Shot!